Hit till oss på Odenstad säteri är ni hjärtligt välkomna att jaga älg, rådjur, räv, hare, bäver, skogsfågel, och sjöfågel, beroende på årstid och tycke. Jaktmarkerna är mycket viltrika, med ett enormt fågelliv längs vattnet! Många fina medaljbockar har skjutits på markerna och varje år skjuts ett flertal bävrar och älgar! Läge: Våra marker är belägna ca 4 mil väster om Karlstad. Göteborg och Oslo når man på 2 timmar. Biotop: Landskapet är en värmländsk dalgång med stora fält där det odlas havre, korn, vall, etc. Detta landskap bryts då och då av med diken och små dungar. I öster ansluter gran/lövskog och i väster sjö och bred älv. Kombination: Jakterna vi har på programmet går utmärkt att kombinera allt efter önskemål. Vi hjälper gärna till att utforma jakten efter Ert tycke och smak. Tips: Läs igenom de olika jaktförslagen. Jaktledare: Som arrangör finns vi tillgängliga under hela jakten, Ni sköter Er dock själva, om inte hjälp önskas. Vilt: Beroende på vad vi gör upp tillfaller skjutet vilt antingen skytt eller arrangör. Ordningsregler: Jägare som upplevs farlig för sin omgivning kommer att av arrangör ombedjas att bryta jakten och jaktavgiften är då förverkad. Moms: Alla priser är inkl moms. Force majeure: Om jakt ställs in av oss pga sjukdom, väder eller andra oförutsägbara orsaker ordnas ny jakt. Only rifles can be used for certain game, including moose, red deer and bear. For ammunition the following requirements apply. Bullets which weigh at least 10 grams (154 grains) must have an impact energy of at least 2.000 joules at 100 metres from the muzzle. Bullets which weigh between 9 and 10 grams (139-154 grains) must have an impact energy of at least 2.700 joules 100 metres from the muzzle. Similar requirements also apply to hunting for fallow deer and wild boar. However, these game species can also be hunted with shotguns loaded with slug-ammunition. Only single-barrel shotguns can be used in this connection. Beavers are also among the species which can be hunted only with rifles. For roe-deer hunting shotguns are allowed only between 1 October and 31 January. At other times rifles must be used. The minimum ammunition requirement for hunting beaver and roe deer is: bullet weight at least 3.2 grams (50 grains); impact energy of at least 800 joules 200 metres from the muzzle. Fully jacketed bullets cannot be used for hunting any of the above species. Shotguns which can be loaded with more than three cartridges may not be used. The largest permitted calibre is 12. Calibres smaller than 20 – with certain exceptions – cannot be used for hunting. The biggest shot size allowed is number US 1 (4 mm). In certain wetland areas it is forbidden to use lead-shotcartridges. It is possible for foreign guests to borrow firearms from a Swedish hunter. If the owner of the weapon is always together with the person who has borrowed the weapon within a few metres – the only requirements are that the foreign hunter must be at least 15 years of age and be in possession of a Swedish hunting permit. If the foreign hunter wants to borrow a weapon for his own use he must be at least 18 years old and be permitted to use the same type of weapon in his own country. The Swedish owner of the weapon must draw up a loan certificate which must be written on a photocopy of his permit for the weapon. On the photocopy must be stated the name of the guest hunter, his home address and address in Sweden, as well as the purpose and duration of the loan, which cannot be longer than 14 days. The information about the guest hunter and his loan of the weapon must be signed by the Swedish owner of the weapon. Foreign hunters who want to go hunting for moose in Sweden should arrange through their host to visit a moose-hunting training range before the hunt. Many landowners and hunting hosts makes it a requirement that moose hunters must have passed a recognised test at the bronze level before they take part in the hunt. During the test, hunters shoot at a life-size figure of a moose at a distance of 80 metres. The test involves shooting at the figure both while it is stationary and when it is ”running”. Dogs imported into Sweden must be vaccinated against rabies, leptospirosis and canine distemper. They must also carry an identification mark and the Agricultural Agency must give permission for the import. If these requirements are not met, dogs must be kept in quarantine for four months. It will be obvious, therefore, that it is relatively complicated to bring a dog into Sweden. Visitors from Denmark, Finland or Norway with permanent permission from proper authority to own and use firearms for private use in these countries may, without any special import permit or fee, to Sweden import these firearms and ammunition belonging to them. The firearms and ammunition may be used in Sweden for a period of maximum three months. The permit of the weapon should be brought along or – regarding Denmark and Finland - the permit of the weapon or the European Firearms Pass. Foreign visitors from other countries planning to take their own firearms on a hunting trip to Sweden must start planning in good time and in co-operation with their Swedish host. As a rule it is best for the host to make an application on behalf of the guest. Permission for the import and export is given by the police authority at the point where the firearms will be brought in to the country. The police have special application forms for this purpose. Applications must be made in good time, at least one month in advance. The permit to import firearms must be shown to Customs at the point of entry into Sweden. Hunters from other EU countries must also, when arriving in Sweden, have the import permit inserted / transferred into the original of their EU Firearms Pass. In some cases the police lodge the permit with Customs and it is picked up by the guest when he arrives in the country. Note! It is very important that the application is sent to the police authority at the point where the firearms will be brought in to the country! The applicants name, date of birth, adress and telephone number. Type of firearm : manufacture, model, calibre and serial number. Quantity and type of ammunition. Name, adress and telephone number of the swedish hunting host. Name and location of the hunting ground. The period of time the weapon will be in Sweden. Place and date of arrival in Sweden. 1. A photocopy of the applicants permit for the weapon in his / her own country ( or other documents that support the right to own and use the weapon for hunting ). 2. A photocopy of the applicants EU Firearms Pass ( only EU citizens ). 3. A written invitation from the swedish host or hunting-tour operator. The fee for a permit to import firearms is 500 SEK, regardless of how many weapons are imported. The fee must be paid at the time of application. If foreign visitors do not have comprehensive insurance cover which is valid in Sweden they must take out a special hunting insurance policy which covers both personal accidents and third party liability. This insurance cover is available to those who join the Swedish Hunters” Association for one year. Membership costs about 300 SEK, including insurance but excluding the association”s magazine. 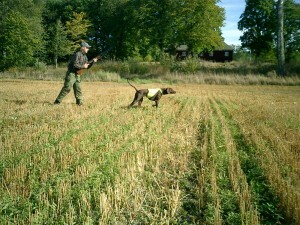 Both the hunting permit and insurance can be arranged through the Swedish hunting host. The fee can be paid at all Post Offices. When the fee is paid the receipt is attached to the hunting permit, which must be carried at all times when hunting.